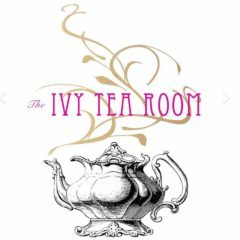 The Ivy is not your ordinary (or typical) tea room. We provide a hip teatime experience. Our tearoom is fun-filled with music and laughter! It is not quiet and stuffy like some more traditional tearooms can be. While some guests prefer the pomp and atmosphere of afternoon tea in a formal setting, at The Ivy we provide a light, airy, and more modern experience. This disclaimer is to help those who may not have our same tastes and style, or who are looking for a traditional tea experience to select a place more customized to their individual desires. Please review the following to help make your modern and whimsical teatime a great one. There is not a time limit on guests’ teatime. We want your experience to feel relaxed and leisurely. Guests may stay as long as they wish (until close). We welcome guests aged 8 and over to enjoy tea with us. Unfortunately, we cannot make exceptions because it would not be fair to others who did not get the exception. Please arrive on time. We understand things happen. If you are running behind simply call and let us know. Without advanced notice your table may be forfeited if the entire party is not present 15 minutes after your reservation. Upon arrival please press the blue and white call button (inside) next to the front door as you walk in to inform us your party has arrived. We treat every guest with kindness and respect and we appreciate the same. If staff members or guests mistreat one another they will not be welcomed back. The ‘Golden Rule’ is a beautiful thing. Guests will be charged for the entire number of people booked at their reservation regardless of how many show up. We will always take into consideration extenuating circumstances. If the number of your party changes please let us know as soon as possible and no later than 24 hours before your reservation. Allergies. Please let us know as soon as possible about any and all allergies. No later than 48 hours before your reservation. Thank you for your understanding. 🙂 This list is designed to ensure EVERY guest knows what to expect and has an amazing experience, preventing misunderstandings before they may occur. If you have any questions about the information listed, please do not hesitate to call or text the tearoom at 505-507-5119.